The second Fang method in a nutshell: dihydroxyl compound 2 is commercially available from enantioselective microbial oxidation of bromobenzene with for instance toluene dioxygenase. In step 1 this diol is protected as the acetal and reacts in a tin bromide catalyzed bromoacetamidation to dibromide 3. The aziridine ring in 4 forms with base LHMDS and is opened again by nucleophilic attack with 3-pentanol to form diol 5 after deprotection. 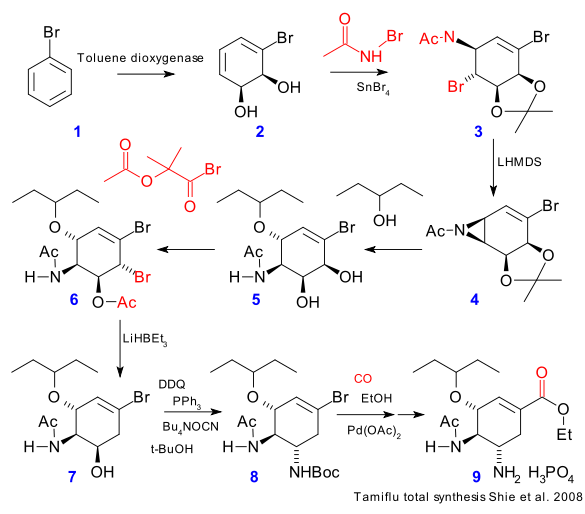 Alpha-acetoxyisobutyryl bromide adds a bromine and a acetyl group to dibromide 6 in one step and the bromine group is again removed by super hydride in 7. The alcohol group is converted to an amide group in 8 in a modified Mitsunobu reaction and the final step (after replacing bromine by iodine) is a palladium catalyzed coupling reaction with carbon monoxide captured by ethanol. The report by Matveenko et al. concerns a formal synthesis and is a modification of the Fang method, more specifically a different route to Fang intermediate 5 starting from the same chiral diol. Although its title promises a chemoenzymatic Tamiflu synthesis you will be disappointed to see no actual enzymes at work. The authors mean that the starting dihydroxyl compound can be obtained commercially by biocatalysis but that is of course not a merit of Matveenko's work. In other aspects the result is disappointing as well. Objective number one is selective protection of the meta alcohol group in intermediate 4 for which acetal 3 is formed in a enantioselective reaction using camphor sulfonic acid and the dimethoxy acetal of Anisaldehyde. It remains unclear however how the newly introduced chiral center can bring about selectivity in the next acetal cleavage (DIBAL) and no surprise, ultimately, selectivity is poor. Disaster strikes again when in the next step formation of carbamate 6 with carbonyldiimidazole and hydroxylamine is accompanied with oxidation to bromoaryl 5. 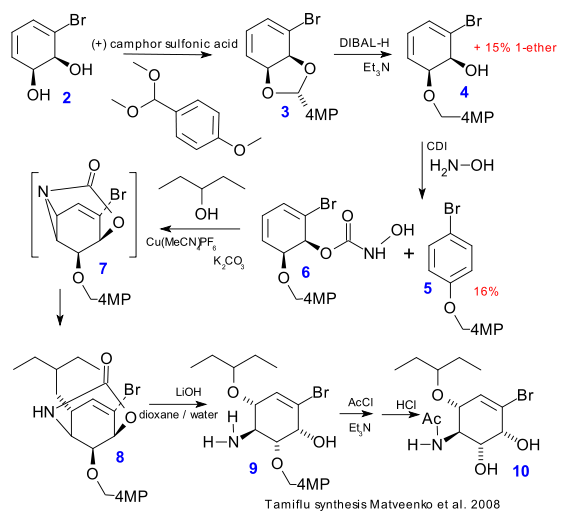 After protecting the alcohol group, construction of the 3-pentanol unit in 8 is catalysed by copper hexafluorophosphate, believed to take place through tricyclic aziridine 7.